Iris ensata ( syn I. kaempferi) are commonly called Japanese Iris. Also known as water iris, they are more of a semi aquatic plant than a truly aquatic plant. A number of colorful varieties are available for sale online. Flowering in early summer they are easy to grow in the garden. They are seen by many gardeners as aquatic plants, however they do handle a range of conditions. Although they naturally grow in boggy ground, they also grow well in containers, or in any moist spot in the garden. They will grow in full sun, however in warmer areas, they perform well in morning sun and afternoon dappled shade. The flowers range in colour from mauve and purple through to violet and blue, all with attractive markings on the petals and a touch of yellow in the centre. 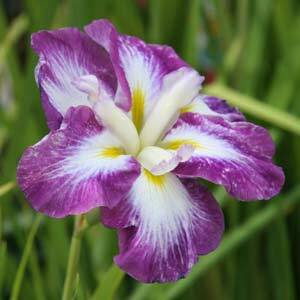 Lots of named cultivars with distinct colours are available, and Japanese Iris can also be grown from seed. The flowers of Iris ensata are large, many reaching to 15 cms across. Iris laevigata is also worth considering for moist to wet soils. Iris ensata thrive in boggy soil, so they are excellent plants for water gardens. They do struggle if left in the water over winter, particularly over cold winters, simply lift the pot they grow in from the water in autumn and return them in late winter to spring. We suggest growing these Iris in pots that can be submerged and placed on a pond shelf or the bottom on the pond. This allows repotting and division to be carried out with ease. Iris ensata are generally sold as rhizomes during dormancy. The rhizomes are planted near the top of the pot. Look for the growing tip and ensure that this is pointed towards the surface. Before planting, choose a pot that is around 20 cm across. You will need to line the pot with either a bio degradable pot liner, some hesion or simply sheets of newspaper to keep the potting soil from escaping through the drainage holes. Newly planted rhizomes are best kept out of the pond until they show signs of growth, this means that the roots will be establishing. Pots can be submerged to a a depth of 5 – 10 cm.In warmer climates we suggest 10cm. ‘Beni Tsubaki’ Beautiful rosy purple flowers with strong white veins. Very attractive and rare. ‘Chidori’. Double white flowers, very large. Iris ensata ‘La Tosca’ Large white flowers flushed with a blue tinge. Iris ensate ‘Rose Queen’ – Beautiful rose pink flowers. Fascination – Another soft pink cultivar. Soil – Boggy to wet in pond margins. Height – 1 – 1.5m in height, although lower growing types to .3m are available. Spread – These are a clump forming iris and will fill a 25cm container in 3 – 4 years. Flower colour – Mostly blues, purple and white with some pink forms. Live most Iris, the Japanese Iris can be grown by separating established clumps. This is easily done in autumn while plants are dormant. Seed purchased online can be problematical. Japanese Iris seeds needs to fresh to ensure good germination. Older seed can be germinated, however this can take up to 2 years. Fresh seed is germinated in a seed raising mix which is kept moist. Try a position in light shade, and use a plastic covering to maintain moisture and humidity. As the seedlings reach a good size, pot them up into a normal potting mix and keep moist. They should be ready to plant out into the garden in 12 months.